The producer of Spey whisky has secured £2.3 million in funding to expand its operations in the UK and overseas as global demand for its whiskies increases. 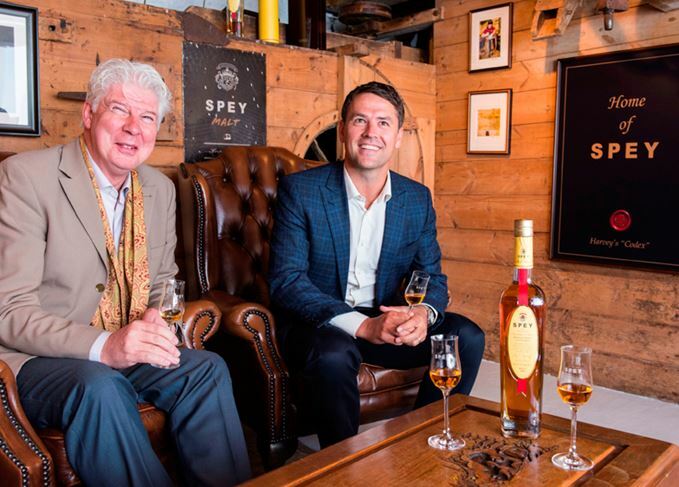 Toasting success: Speyside Distillers CEO John McDonough with Spey whisky brand ambassador and former England footballer Michael Owen. Speyside Distillers Company, which owns the Speyside Distillery in Kingussie, will use the funding package from Clydesdale Bank to ‘produce and acquire more stock to meet demand’ for its Spey whisky brand. Currently available in over 20 markets globally, including Taiwan where it is one of the biggest Scotch whisky brands, Spey is experiencing increased demand from countries such as Vietnam, Malaysia and Thailand. John Harvey McDonough, CEO of Speyside Distillers, said: ‘Spey is one of the biggest brands in Taiwan, but over the last few years we’ve also focused on growing our presence worldwide and here in the UK. ‘As a result, our whisky is now available in several key and emerging markets, including Germany, Russia, Australia, France and the Netherlands. The funding will also be used to support the roll-out of the group’s Beinn Dubhbrand, a single malt matured in Port casks that has a black hue. ‘The Bank’s support was also crucial to incorporating our new brand, Beinn Dubh, which was launched in August last year to rave reviews from whisky lovers around the world,’ McDonough added. Spey is a series of single malt bottlings featuring liquid from Speyside distillery, as well as from within the Inver House and Whyte & Mackay portfolios. The Snug in Aviemore will host tastings, events and local art away from ‘the secret distillery’. The first release from Ailsa Bay lands on Dave Broom’s doorstep this week, alongside other delights. In the first of a series of Speyside musings, Dave Broom packs his bags in a state of confusion.